I have long wanted to tell the stories of what I consider to be the three most important instruments that have influenced – and arguably, created – today’s growing harp guitar movement. Roughly concurrent in their discovery (or creation) and use, they are Michael Hedges’ Dyer Style 4, Stephen Bennett’s Dyer (also a Style 4), and John Doan’s modern Sullivan-Elliott concert harp guitar. 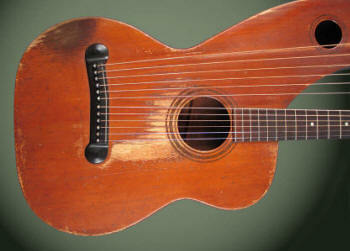 Virtually everything we have been able to gather on Hedges’ Dyer and his harp guitar use has been chronicled here. Meanwhile, while we wait for John’s seminal instrument to “age” a bit, the obvious instrument to chronicle for posterity is Stephen Bennett’s life-changing instrument. It is especially timely now, as it is the 100th anniversary of his iconic Dyer and Stephen is touring with it all year, something he has not done in some time. I was fortunate to have the master himself stop by for a short visit, and took the opportunity to photograph it. Rather than having me try to scribble down a few notes gleaned from Stephen, we simply turned on the tape recorder and let him tell the story as we’ve always wanted to hear it. I love the fact that, although we unfortunately have no direct words from the original owner, Stephen’s great-grandfather Edgar Pierce, a hundred years from now – on its 200th anniversary – we’ll have Stephen’s story in his own voice, still airing on Harpguitars.net. Something I take pains to point out whenever possible is the utterly perfect dumb luck (fate?) that allowed John Doan to stumble upon one of the extremely few Knutsens with treble strings (which led directly to his modern instrument) and also dropped a Dyer 6-sub-bass harp guitar literally into Stephen Bennett’s lap. Think about it. 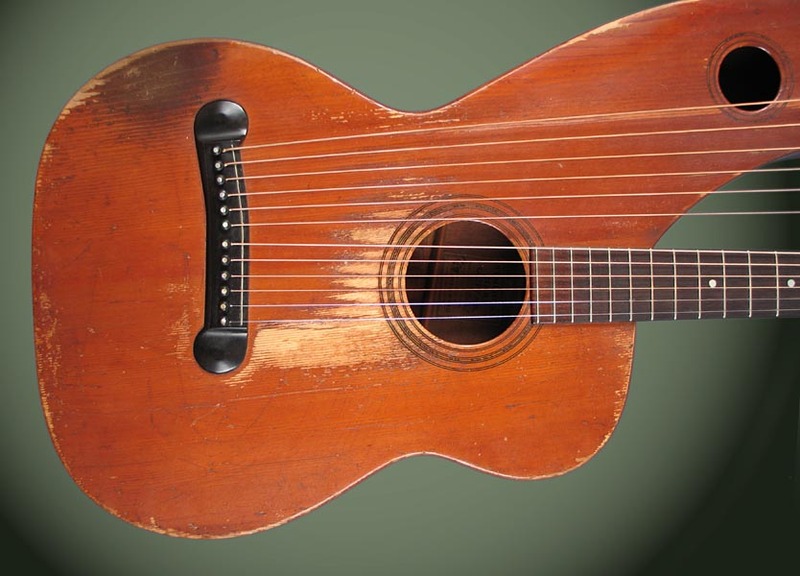 The odds of his great-grandfather owning a Dyer harp guitar as opposed to another harp guitar are not astronomical – there were a few hundred made – but they were still incredible. 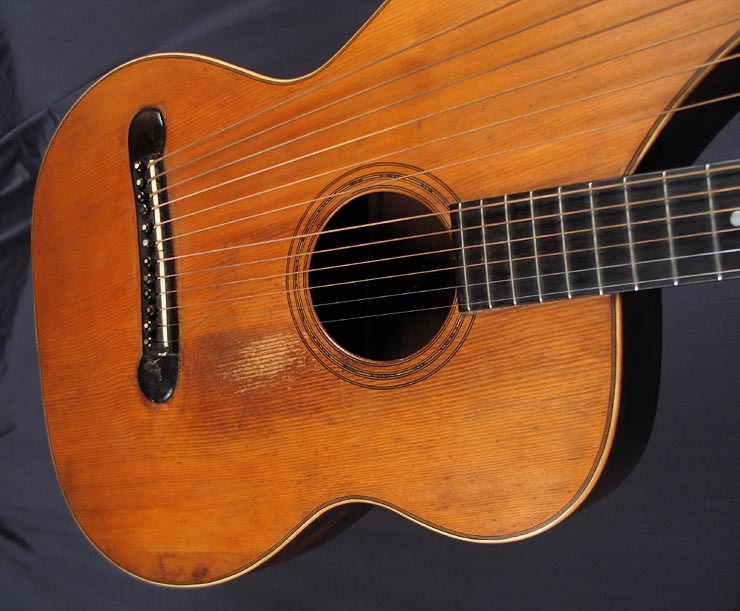 A far larger number of the more popular Gibsons were in the hands of 1900’s American guitarists (I estimate that a couple of thousand were sold) and there were of course a multitude of other harp guitar makers at the time from which to choose from. But luckily for Stephen, and ultimately for us, his great-grandfather chose the Dyer. 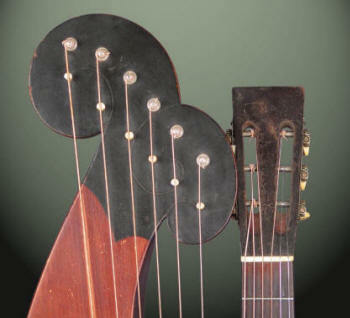 By 1909, six, as opposed to five, sub-basses had become standard – again, lucky for us, or we wouldn’t have that great extra-high-G Bennett tuning! 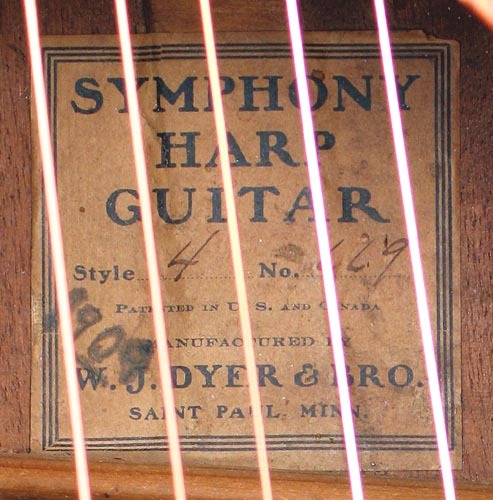 Why is it so fortunate that Stephen inherited a Dyer as opposed to one of the many other harp guitars? 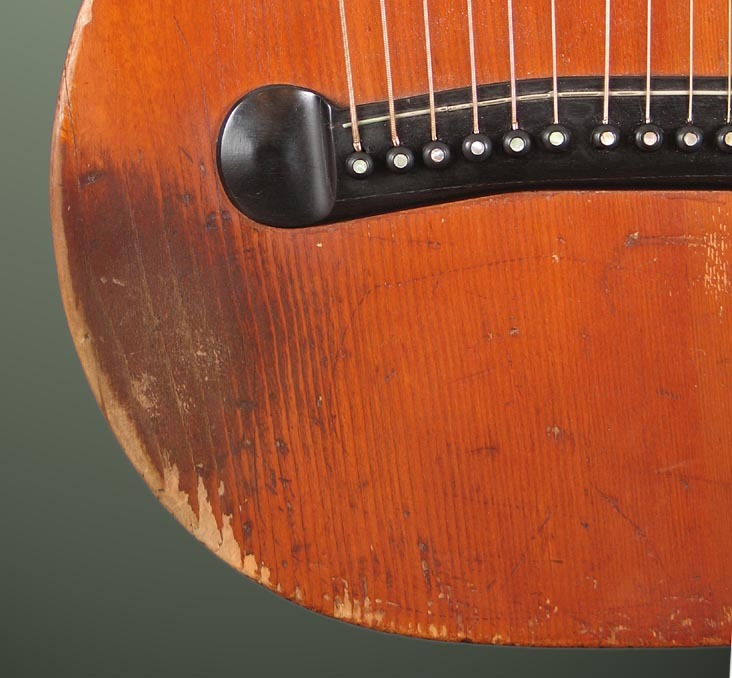 Because a hundred years of history and experience have shown the Dyer to be by far the finest steel-string flattop harp guitar ever designed and produced – akin to the best 6-string Martin and Larson flattops and modern boutique acoustics. 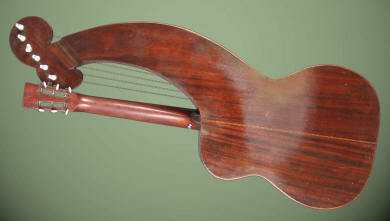 Only a very few of the best modern harp guitar luthiers have possibly ever equaled or surpassed it. It was thus the perfect fit with Stephen’s already formidable fingerstyle technique and musical expression. So much so that today it is hard to imagine that there could have been a time when Stephen Bennett was not playing a Dyer harp guitar, it is such a match made in heaven. Left: The sub-bass tuners were replaced with modern 4:1 banjo tuners and a Pick-up the World soundboard transducer was installed. Everything else is gloriously original. There are a couple of interesting features about this instrument. The first thing one might notice is the unusual dark color. This is clearly not normal Larson shellac that has darkened over time; it is a dark stain uniformly applied to the top (the back and sides are the normal dark mahogany). Is it original? I think it is. Bob Hartman thinks he has seen perhaps one other dark specimen. As a one-owner guitar that has obviously been well-loved and well-played, it seems unlikely that Stephen’s great-granddad would have bothered to have had it refinished. No, I think the clue is in the grain of the top. I have never seen a spruce grain width like this in my life! An extreme example of “run out,” the bass side grain width expands to a full half an inch out at the edge! While I’ve seen plenty of Dyers with less than perfect tops (see this one for example), this is an extreme. Did the Larsons realize the same thing and decide to mask it with a rare stained varnish? This top “defect” doesn’t seem to be ruining the sound – another example of the myth of top grain-per-inch count (or at least the random importance of). Perhaps it’s even part of the great tone. Stephen loves the sound of this instrument. Unlike a typical Dyer, I find it curiously lacking in overtones, even after a hundred well-played years. However this is not a detriment. Instead, it has a robust piano-like tone, warm and clear with incredible balance and note separation. Our next point of interest is the serial number and the handwritten “1909.” Bob Hartman’s latest serial number / date list (in his final book edition) puts the serial number, 669, at circa 1914. 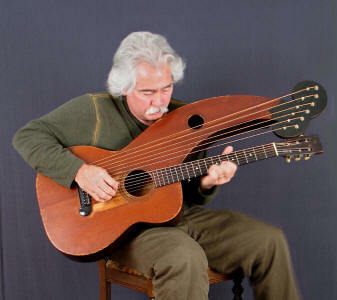 After a couple decades of data collecting, we still adhere to this best guess for Dyer harp guitars. The theory being that a gap in serial numbers from 300 to 600 (no numbers have been found in this range) equates to the transition from Knutsen-signed labels to non-Knutsen labels, when Dyer re-started the numbering system with #600. It was always assumed that this transition occurred when Knutsen’s 14-year patent expired in February, 1912. The next assumption would be that Stephen’s great-grandfather Edgar himself wrote the “1909” by hand through the soundhole (for who else would have?). We thus have a five-year discrepancy. There are two main possibilities here: either Edgar wrote the year later in life and got the year of purchase wrong, or it is correct, and our Dyer dating scheme is off by five years. 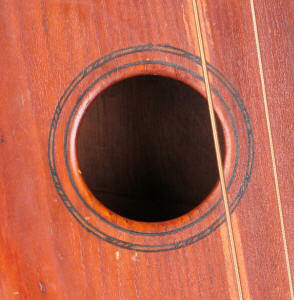 As will soon be shown on the Dyer portion of this site, I believe that the precise dating is still a mystery, and that specifically the harp guitars must be in a different sequence than both the harp mandolins and the mandolas/mandocellos (which use a third sequence, different from the mandolins). 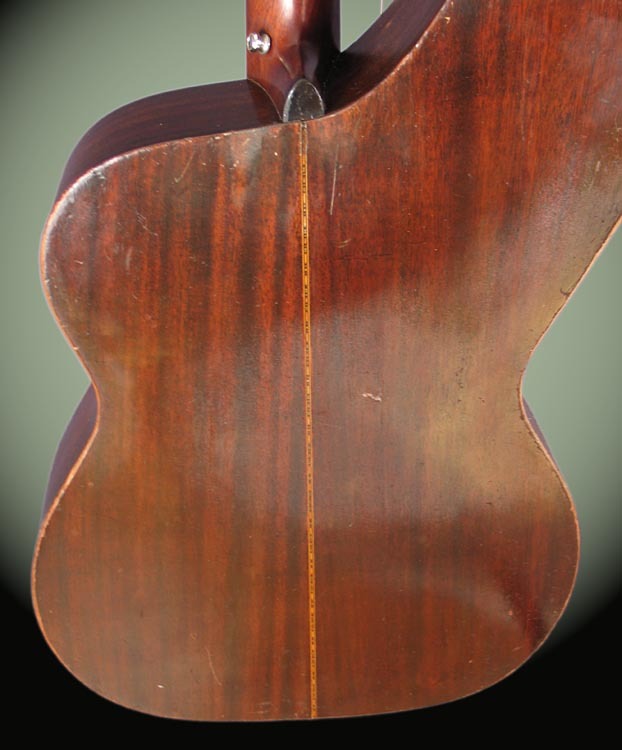 For the 1909 date of #669 to be correct we must pursue an alternate theory where Dyer “paid off” or otherwise terminated the Knutsen contract before the patent expired – say, around September, 1908 when the Dyer harp mandolin was introduced. Bottom line, until we find a dated receipt with an instrument (which I’m ever hopeful of) we can never say for certain, and there’s a legitimate 50/50 chance that Stephen’s 2009 centennial anniversary is accurate. I was stunned to discover that, despite the heavy playing wear from Edgar’s metal National fingerpicks and fingernail wear in the fretboard, the instrument still has the original frets. It also has the original fretwire saddle, as does my Style 8. Unlike my Style 8, however, Stephen’s intonates perfectly on every string and fret and has been used as a professional harp guitar all the way from Edgar’s radio performing to Stephen’s latest CD recording! And so we present the iconic harp guitar adopted by Stephen Bennett that begat the Harp Guitar Gathering, which begat Harpguitars.net, Harp Guitar Music, and helped escalate the modern harp guitar movement! 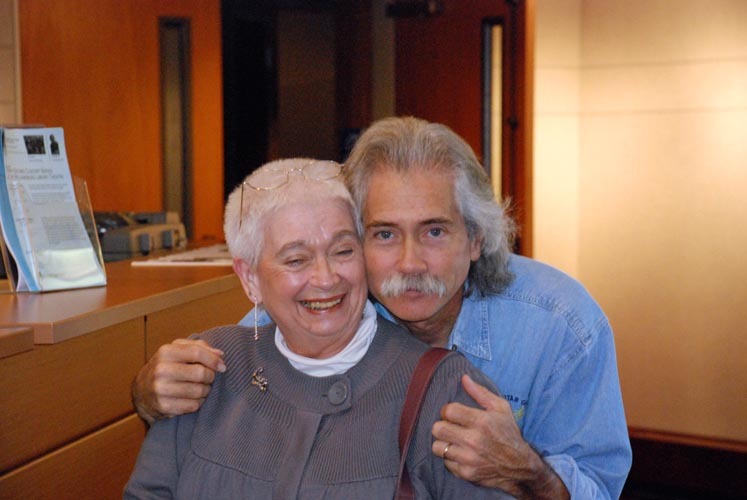 "The story I was always told about how they came to be called Augie and Gonky was that when I was learning to talk and they tried to teach me to call them Grammy and Grampy, that was the closest I could come. Maybe I had a hearing problem. Anyhow, that's the story and I'm stickin' to it." All Site Contents Copyright © Gregg Miner, 2004,2005,2006,2007,2008,2009. All Rights Reserved.